We must give a big Seaport welcome, as Boston’s most high-profile corporate “get” officially moved forward last week. 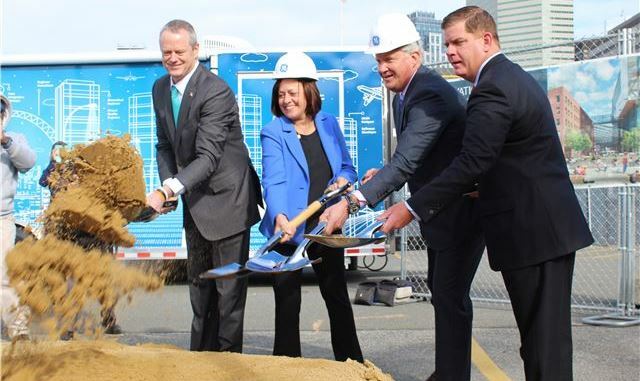 General Electric broke ground on Innovation Point, its new $200 million global headquarters on Fort Point Channel. “We named this campus GE Innovation Point because this isn’t going to be your grandmother’s headquarters,” said Ann Klee, GE’s vice president of Boston development, at the event. Boston Mayor Marty Walsh and Massachusetts Governor Charlie joined Klee along with GE CEO Jeff Immelt to launch the waterfront complex. The company announced last year it would move to Boston from its longtime home in Connecticut after surveying several cities nationwide for a potential relocation. The site was chosen for its proximity to South Station and Logan Airport and is expected to contribute to the mayor’s push to activate the channel from the Seaport into points in South Boston and Dorchester. We look forward to sharing the Silver Line to South Station with our GE neighbors!